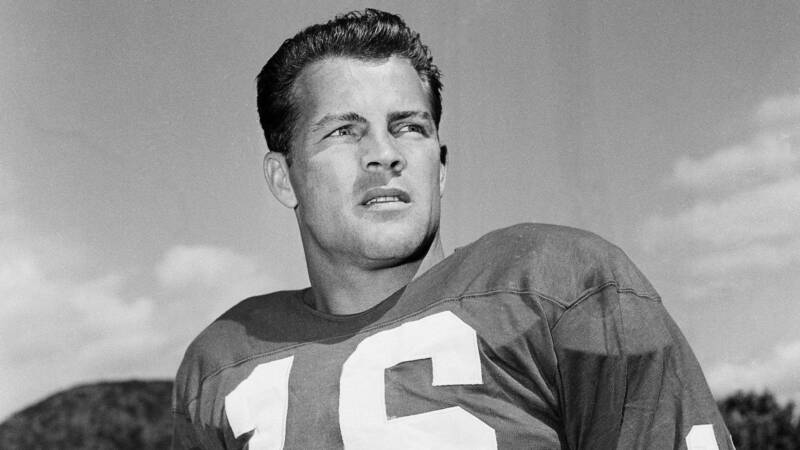 Frank Gifford was a household name all over the United States. Many Americans knew of him through his football exploits. Others knew about him because of his years of work as a broadcaster calling play-by-play on "Monday Night Football" telecasts. Still others knew about him because of his marriage to TV personality and singer Kathie Lee Gifford. Gifford died not long ago at the age of 84. His family said at the time that he died of "natural causes." Just the other day, the other shoe hit the floor. Gifford's family revealed that the former New York Giants running back and receiver suffered traumatic brain injury that he incurred while playing professional football. He took too many hits to the head. Frank Gifford was one of a growing number of professional football players who left the game permanently damaged by the contact delivered on the playing field. "Frontline" first broadcast its groundbreaking documentary "League of Denial: The NFL's Concussion Crisis" on Oct. 8, 2013. Watch League of Denial on Panhandle PBS. "Frontline" broke a lot of ground when it broadcast "League of Denial" on public television stations. It also upset a lot of individuals and institutions affiliated with professional athletics during the production of the special. ESPN, which was a partner with "Frontline," backed out of the agreement to work on the segment. There were questions raised at the time about ESPN's close working relationship with the National Football League. "Frontline" finished the project that has been seen as a landmark documentary. It explores the damage being done to professional football players who suffer from chronic traumatic encephalopathy, or CTE. The disease is believed to result in debilitating dementia and all that it entails. The "Frontline" documentary examines whether the NFL covered up the damage being inflicted on its athletes, which quite naturally the league has denied. One of the men highlighted in the documentary is the late Mike Webster, a Hall of Fame center who played for the Pittsburgh Steelers. Webster was known for his habit of playing football in the coldest weather imaginable without any covering over his massive arms; he liked to show off his "guns." Webster also took a lot of blows to the head while playing on the offensive line for the Steelers. After retirement, the future Hall of Famer went through a series of emotional crises. He ended up homeless, penniless and eventually was institutionalized. Later, after his death, it was revealed that he suffered CTE. Indeed, the only way to diagnose the illness is through autopsy. Fast forward to today and we find that another Hall of Famer, Frank Gifford, suffered from the same malady that has afflicted so many other professional football players. Christine Brennan, a columnist for USA Today, said Sunday morning that Gifford's death might do for CTE what other celebrities have done for diseases such as AIDS or Parkinson's. She noted that Rock Hudson's death from AIDS and Michael J. Fox's public battle with Parkinson's have elevated the national consciousness regarding those two maladies. The same might now occur with Frank Gifford's death and the revelation that he suffered from a traumatic brain injury.